Oladi – Russian Kefir Pancakes (Оладики) is a breakfast favorite, topped with jam, homemade sour cream and fresh berries from the garden. Made with Kefir, it’s a Russian breakfast classic. 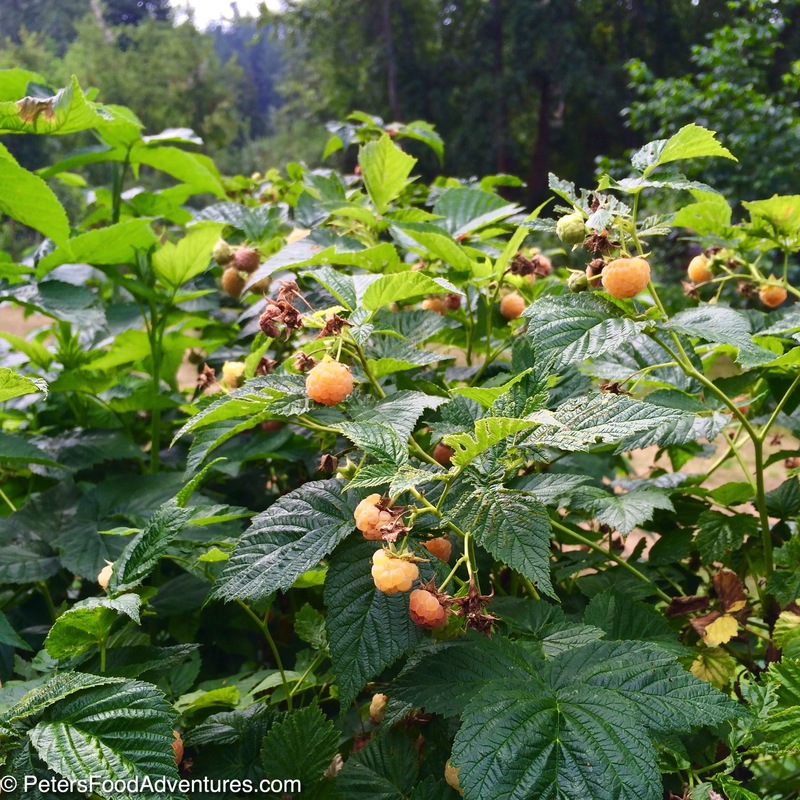 We grew up with so many raspberries in the garden, rows and rows. At one time, I think I counted 12 long rows of raspberries. This meant hours and hours of picking fresh raspberries during our summer holidays. When we had company visiting in the summer, which was often, mum would make these thick Oladi – Russian Kefir Pancakes (Оладики) for us with fresh berries just picked from the garden. Oh, it was so good, beats maple syrup any day! 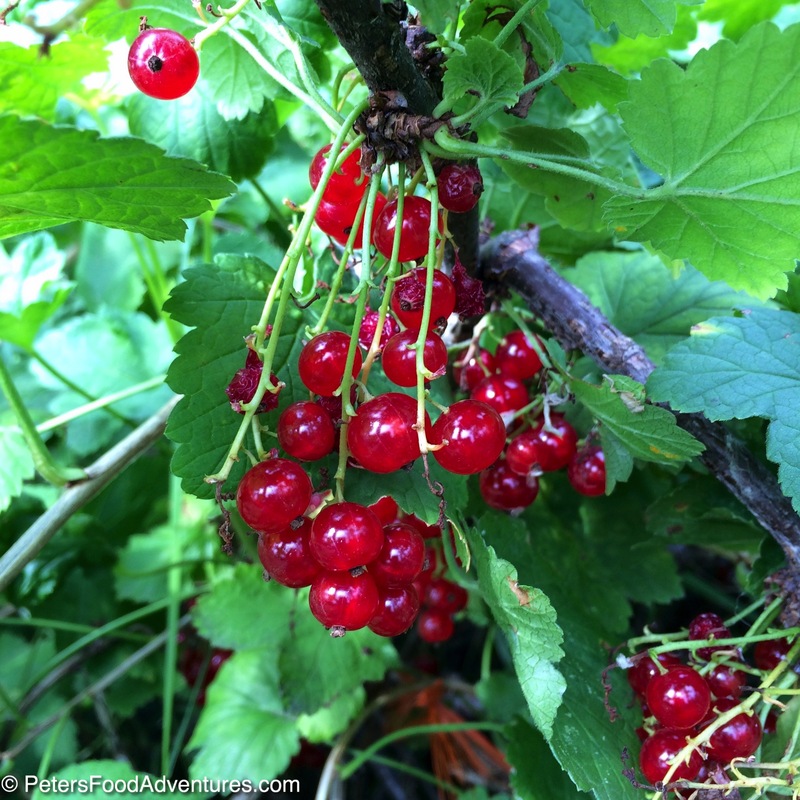 With all our extra berries, mum would also make kompot, which is a homemade berry juice. We ate a lot of berries! So this is my bit of nostalgia that I got to re-live recently at the summer dacha (which is like a Russian cabin in the woods). Mum treated us with her famous pancakes for breakfast. 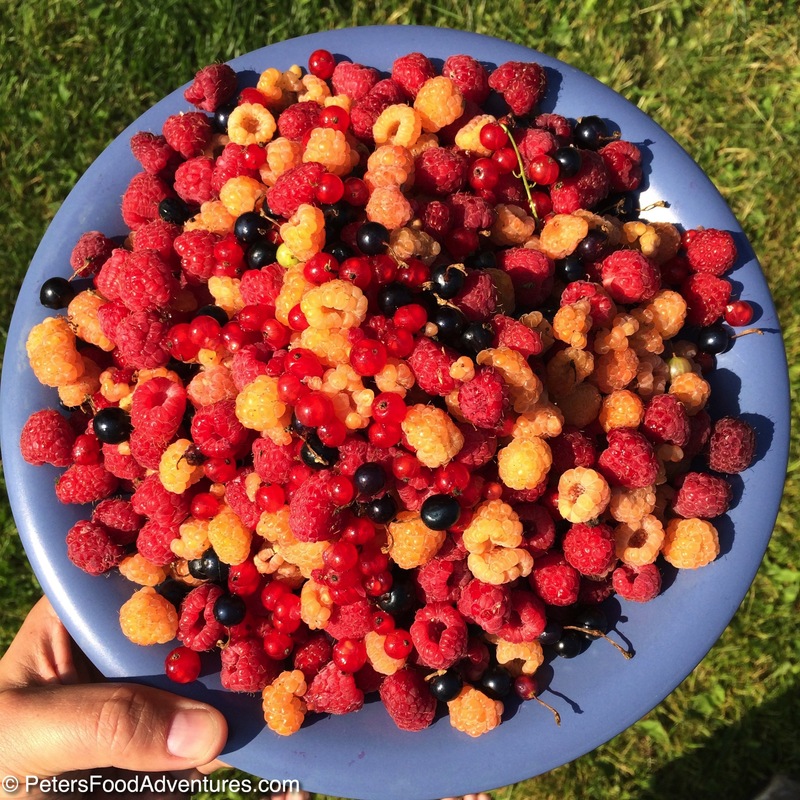 Dad spent the morning picking all fresh red raspberries, black currants, red currants and yellow raspberries. It does perfectly with blueberry jam and sour cream. Sounds weird, but it’s so delicious! This is an easy ‘made from scratch’ pancake recipe, with one difference. Kefir. Many people haven’t heard of Kefir before. It’s a probiotic filled, fermented yogurt like product that is incredibly healthy and part of the Russian diet. Kefir can be hard to find sometimes. You can substitute with buttermilk, or if you are making homemade Farmer’s Cheese, use the leftover whey. I find Oladi aren’t as sweet as many pancake recipes. This is due to the tanginess of the Kefir and the less sugar used when comparing to other pancake recipes. If you want sweeter pancakes, add an extra tablespoon of sugar to the batter. 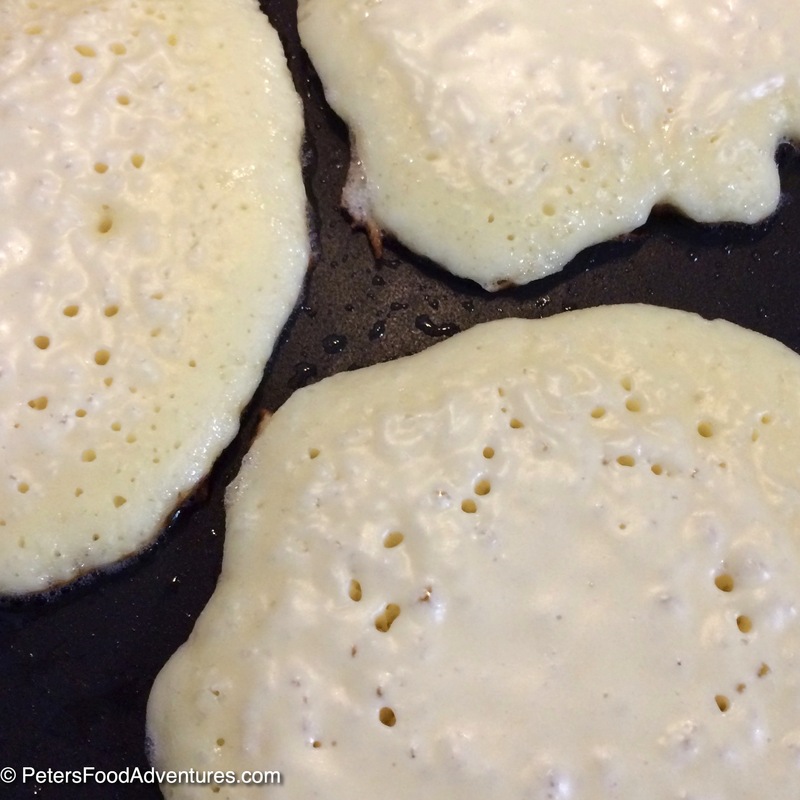 Don’t use store bought pancake mix, try this healthier version of Russian Kefir Pancakes – Oladi. Your tastebuds will thank you. Bon Appetit! Приятного аппетита! In a medium bowl, mix together flour, baking powder, sugar and salt. Create a well in the centre, and add the kefir, eggs, and oil and slowly whisk until smooth and most of the lumps are gone. Heat 1 tablespoon oil in a frying pan over medium heat. Make sure the frying pan is hot. Add about 2 tablespoons of batter to make each pancake. You should fit 3-4 pancakes in a large trying pan. Cook the pancakes until bubbles appear on the pancakes and a few of them have burst. The trick is to get as many bubbles bursting as you can without burning the pancakes. Carefully flip the pancake to cook the other side until golden brown. Remove pancakes to a plate or on a tray in a warmed oven. 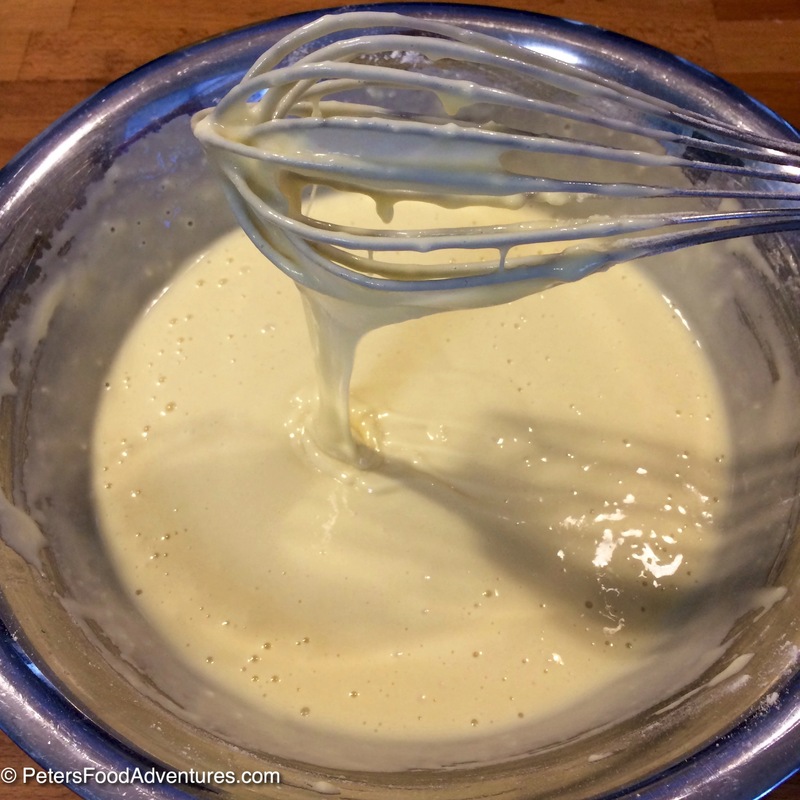 Add more oil and repeat process with the remaining batter. Serve with fresh berries, jam and sour cream. For thicker and fluffier Oladi Kefir pancakes, add 1 teaspoon of baking soda to the pancake mix. Thanks! The fruit was amazing, especially the yellow raspberries! It’s so good drowned in whipped cream, but thats hard to photograph! I am sure! your photos are very nice! I just love fresh fruit on pancakes and waffles. The best of summer! Unfortunately we don’t get raspberries, too hot I guess. I buy them frozen now and then or use our blackberries from the garden in season. Your pancakes look fantastic. I made these for breakfast today instead of the usual Costco mix. What a difference! I took your suggestion and used the whey left over from your tvorog recipe. My four kids fought over the last one, to the extent that the last pancake had to be cut into 4 equal parts. It’s my new go to fabulous breakfast hit! haha, it’s always great when kids fight over healthy food! I love using leftover whey from tvorog, just adds a mysterious depth and flavour to food, so delicious! I enjoy receiving your recipes by email. Thank you. I am looking for a traditional Russian blini recipe for Maslenitsa next week. They are made with yeast etc. Would you have it ?